Stacy Clark examines a young chestnut tree. Photo by U.S. Forest Service. “Chestnut restoration will require an integrated approach that uses traditional breeding, advanced seedling technology, and forest management,” says Clark, research forester with the SRS Upland Hardwood Ecology and Management unit, and lead author of a new review article recently published in the Journal of Forestry that evaluates restoration efforts thus far and offers recommendations for the future. Two nonnative fungi that cause chestnut blight and ink disease essentially erased the American chestnut tree from the landscape by the early 20th century, and although new shoots continue to emerge from ancient roots, they eventually succumb to blight. Tree breeders have attempted to produce blight-resistant trees for decades, but research was largely unsuccessful until a backcross breeding approach using Chinese chestnut and modern biotechnology techniques became available. Through a combination of traditional breeding and biotechnology, scientists at the American Chestnut Foundation are developing chestnut seedlings that are expected to have the blight resistance of their Chinese parents, but the appearance and ecological traits of their American parents. 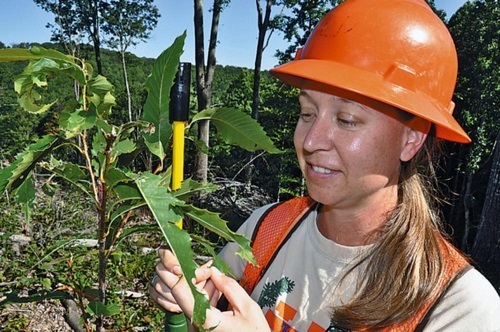 Researchers at the Connecticut Agricultural Experiment Station and the American Chestnut Cooperators’ Foundation are also developing disease-resistant trees with breeding and biological control of the blight. In 2009, researchers began testing blight resistance by planting seedlings from the American Chestnut Foundation in national forests. The Forest Service Northern Research Station established several test plantings, and Clark, along with her SRS colleagues, initiated the largest study, which had eleven test plantings and spanned three states. “Our study is ongoing, but results from the first four years show that ink disease was the biggest threat to the chestnut seedlings,” says Clark. In some sites, less than 40 percent of the seedlings lived, although in other sites more than 80 percent survived. Planting high quality seedlings could be the best way to overcome ecological challenges to restoration. “Healthier seedlings would be more likely to be competitive, recover from animal damage, and tolerate drought and other weather events,” says Clark. “Restoring the American chestnut to our forests is theoretically possible,” says Clark. “However, without continued research and partnership, success will be limited.” Clark and her colleagues suggest that the Forest Service develop short-term (five year) restoration goals such as establishing and maintaining long-term multidisciplinary experiments. Although several long-term studies are in progress, they are only designed to test blight-resistance. “As with any disease, chestnut blight interacts with genotype and environment,” says Clark. Test plantings on national forests currently rely on general funds that can be used for regenerating species such as oak or pine. “Chestnut test plantings are more expensive to implement and usually less successful compared with other vegetation work,” says Clark. Clark and her colleagues also emphasize the importance of partnerships and the need for communication between national forests, scientists, and other stakeholders. « Older Previous post: How do Wildfires — And Efforts to Abate Them — Affect the Nation’s Water Supplies?